Calendar arranged for quarterly planning. Large, bold green and blue printing on bright white background is easy to see and read. One full side bordered and sectioned for ruled and unruled notes. Write-on, wipe-off surface erases easily with a damp cloth. 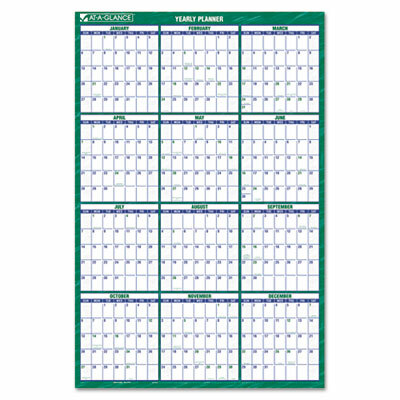 Calendar arranged for quarterly planning. Large bold green and blue printing on bright white background is easy to see and read. One full side bordered and sectioned for ruled and unruled notes. Write-on, wipe-off surface erases easily with a damp cloth.